Angelic Chiropractic offers golf swing analysis, muscle memory rehabilitation instruction along with stretching and strengthening programs for the muscle groups needed to play golf. We will assess your golf swing and explain from a biomechanical perspective what you are doing that may cause pain and damage. Once the problem has been determined, drills or exercises will be suggested to change the current swing problems and create new muscle memory. We then test you to determine what muscles are lacking strength and flexibility and offer training suggestions to help you not only decrease pain, but also improve your game. We are not golf pros; we are body pros and will help you to stop hurting yourself when you swing. Angelic Chiropractic is pioneering new methods in stroke rehabilitation. Our program consists of chiropractic treatments, nutritional counseling, cold laser rehabilitation and low pressure hyperbaric therapy. Chiropractic care removes additional stresses to the over taxed nervous system. Nutritional counseling determines what nutritional needs the body has to foster healing. Cold laser rehabilitation speeds the creation of new neurological pathways allowing motion in the body to return. Hyperbaric forces oxygen deep into either nervous system tissue or tissues to stimulate healing even where the blood supply will no longer go. After years of eating the standard American diet aka SAD, most of us are in need of some type of nutritional boost. At Angelic Chiropractic & Health Services, Inc. we will assess which of your organ systems are in need of assistance. We will then determine what vitamin, mineral and herbal combinations will work best for your individual needs. 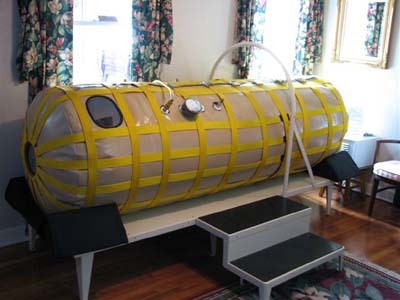 Angelic Chiropractic & Health Services, Inc offers low pressure hyperbaric oxygen therapy. By placing your entire body into a pressurized soft sided chamber all of your tissues will passively absorb higher levels of O2. Higher levels of oxygen allow you to detoxify and heal all tissues in the body. This therapy is being used in our stroke rehabilitation and is used for longevity around the globe. Angelic Chiropractic offers 3 types of detoxification programs. 1. IonCleanse Detoxification is a foot bath that passively removes toxins through the pores of your feet. 2. The 10 day anti-inflammatory diet is a generalized program that eliminates several types of foods from your diet while you drink a Biotics Nutriclear Protein shake in addition to your meals and take supplements designed to support the cleansing process. This program is designed to decrease pain due to inflammation. 3. The 21 day total body cleanse is an individualized program that eliminates several types of foods, cleans the digestive system of toxins and parasites, cleans the liver and gall bladder while enhancing digestion. This program is designed to decrease pain, increase energy and mental clarity while you increase your health. To determine what cleanse is best for you take the toxic test. Here at Angelic Chiropractic we believe that you must remain active to be healthy. We will offer suggestions on exercises to help strengthen your core to help you maintain your adjustments.